Dai Fujiwara, the creative director of Issey Miyake was one of my favourite speakers at the Design Indaba. 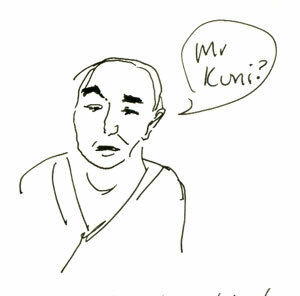 Although his English was broken, this seemed to help rather than hinder his ability to communicate. He charmed us with his self deprecating and oddball sense of humour. To start with, he showed us the “a poc” concept. A poc stands for a piece of cloth, and that is just what it is. 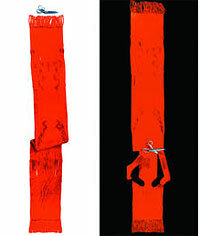 A tube of cloth that has been machine knitted or woven in such a way that a person can cut part of it off, and create a customised piece of clothing, styled as they prefer. So the wearer participates in the design process. This animation reminded me of Rick Valicenti‘s notion of “real human presence”, and the animation he showed us which depicted abstract shapes moving on points determined by real dancer’s bodies. 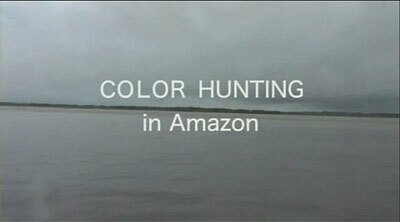 Another amazing video was the documentary of Dai Fujiwara’s colour hunting trip into the Amazon forest. He went there to collect a colour palettes for Issey Miyaki’s new spring/summer collection for 2009. 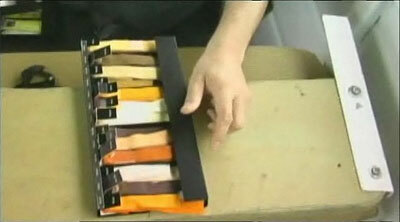 As you can see, Dai and his team travelled with a huge collection of cloth colour samples. They tested these against trees, leaves, bark and mud to find the palette of the forest. To test the veracity of their choices, they strung strips of cloths over open spaces like the river. If the colours “melted away” and did not stand out from the background, they knew they had chosen the correct ones. The last couple of frames shows them testing colour samples from a motor boat over the Amazon. The river, they found, had more in comon with human skin than they had anticipated. This was the point of the expedition. 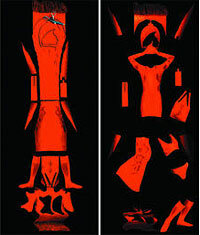 Dai Fujiwara told us that where he had expected bold and brash colours, he had found shy, quiet, muted tones. You can watch the movie at this site. Click on the “menu” link and scroll down to the “Color Hunting Movie”. Further colour hunting took place in the cities of Brazil. Here they used some different methods. They took many photographs, and then spun them to create streaks of colour. These streaks became the basis for their Urban Brazil colour palettes. Another amazing project was the “Karate Ka” design. Dai’s team observed male and female Karate champions going through the motions of a Kata. They then designed a two piece suit for each. What is remarkable about this suit is the inset of stretchable polyester pleating that curves down sleeves, backs and legs. This allows the suit to accommodate the most abrupt of punches, kicks and twists that the Karate champions could deliver. The suits themselves are muted. Grey, neat and not unusual at first glance apart from being drop dead stylish – until the model moves. They are a compelling combination of ceremonial formality and athletic power. I could find no good pictures of them – alas. Love was a word he used often.